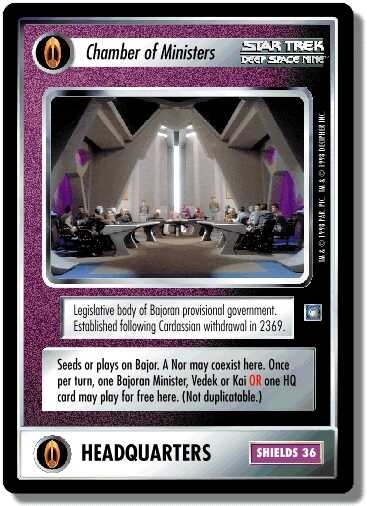 Legislative body of Bajoran provisional government. Established following Cardassian withdrawal in 2369. Characteristics: Headquarters, affiliation, play for free / report for free. Requires: HQ card, Kai, Minister, Vedek, Bajoran species. The text “A Nor may coexist here” on this facility overrides the normal rule that you may not establish more than one facility at a location. However, Chamber of Ministers is not required in order to seed Deep Space 9/Terok Nor at Bajor. “A Nor” is a reference to the type of station (allowing Deep Space 9 or Terok Nor to seed there), not to the card named “Nor,” which may not be established at a Bajor region location. This facility can play (but not seed) on the Mirror Universe Bajor. No cards may report there because the facility is not in its native quadrant. There are 36 entries for Chamber of Ministers (ST1E 5 R 79) at the Tradeplace (42 haves and 17 wants). Click here to see all trade list entries for this Rare card!